You are currently browsing the category archive for the ‘Country Western music’ category. brad paisley: what a show! Tractors and stadium workers worked the soil that the Rodeo tore through for the last four hours. It was fun. 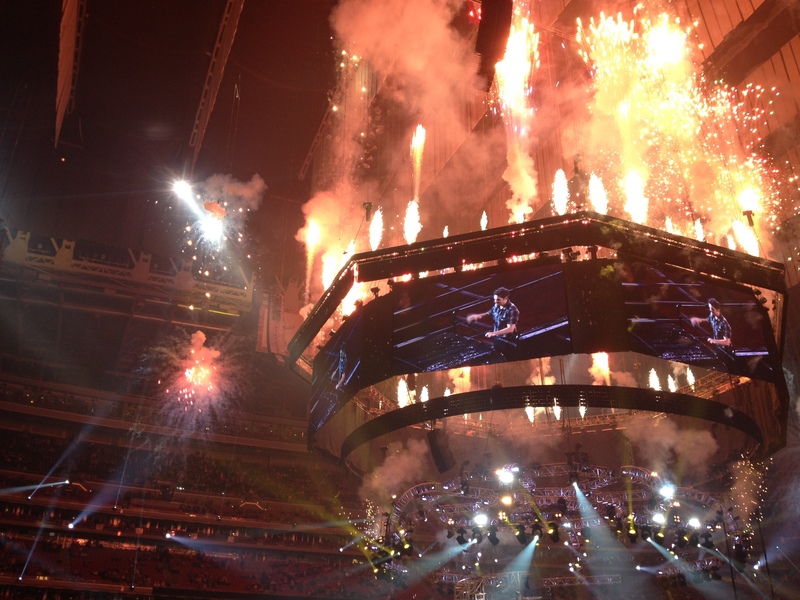 The Houston Rodeo made the American pride in every citizen swell to where we were popping buttons. Now, the announcer re-energize the crowd, “Get ready, folks because Brad Paisley is in the house!” The thunderous roar reverberated throughout the stadium. Teenagers to my right screamed with a high shrill while senior citizens to my left applauded vigorously. Stage hands rolled out the stage on to the Rodeo dirt floor. Clearly this was masterminded by gifted engineers and rehearsed several times by set-up crews. Still it was a wonder to behold a rodeo arena transformed into a premier concert stage in a matter of minutes. The lights of the stadium were dimmed. A hush fell over the 70,000 fans. Expectation could be felt all over. There were musicians on the stage. It rotated so that everyone in the stadium could sense the pulsation of the Country beat that began to rock the great venue. 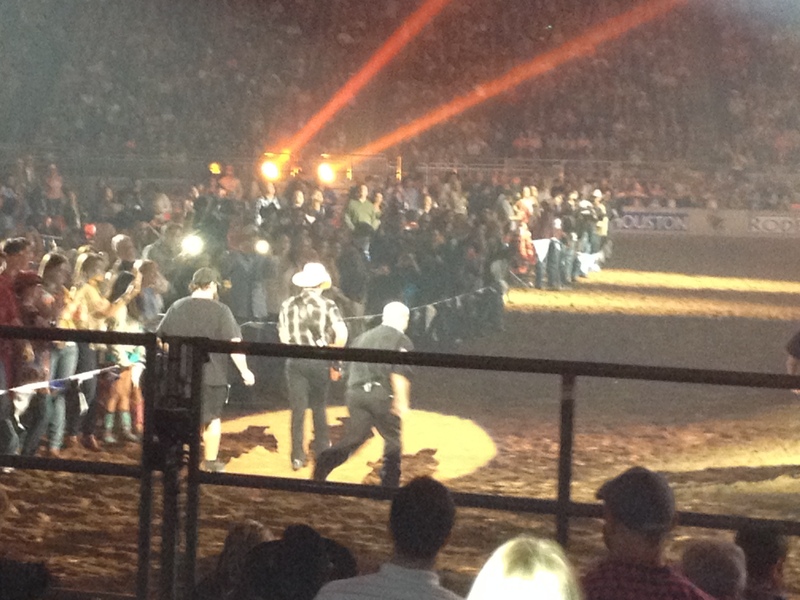 A black crew cab pickup truck rolled out on to the floor and drove right up to the stage. It was not hard to guess what was coming. 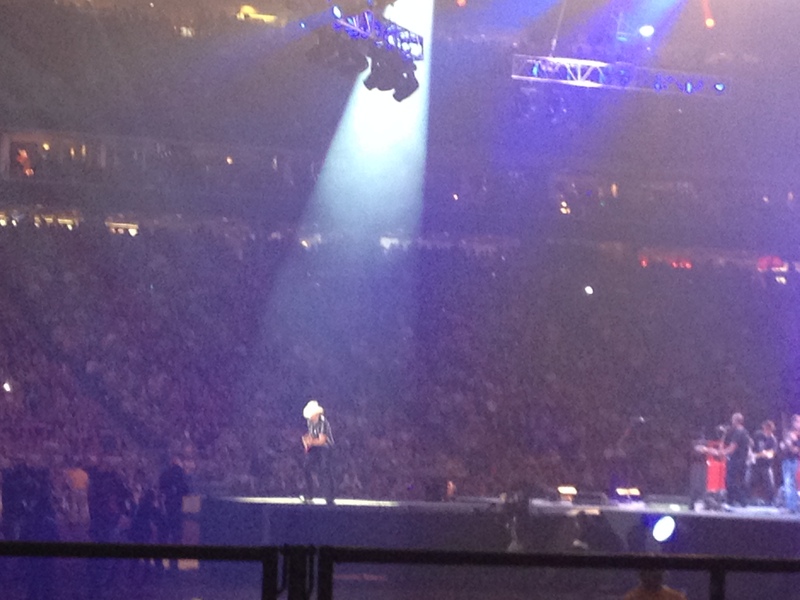 Brad Paisley got out the truck, donned his guitar and trotted up to the stage. The huge ovation was louder than a jet plane that had just delivered a high-profile package. The concert began with one great Paisley song after the next. From one great hit to the next the band played whatever modulation was necessary to get into the next key and never wasted a single quarter note between songs. Paisley was vintage! His singing was the familiar voice that all of us played over and over on our music machines. On top of that were the instrumental interludes where his virtuoso guitar skills are becoming legendary. The energy hit a maximum human effort and never let down. The rotating stage never paused. Paisley hopped off and ran to be next to the fans. People went nuts! Selfies were popping, hand slapping was firecrackers and hugs were the preferred expression as applause from those too far away thundered with the music. Security ran along with this Country Western superstar. The crowds were excited but very respectful. Then, the climax came with his final song. The pickup truck rolled up to the stage and Paisley stepped into the bed and rode in the back while waving good-bye to the crowd. Fireworks exploded and he threw his hat to an adoring fan.